Black Death - WHAT IS BUBONIC PLAGUE? 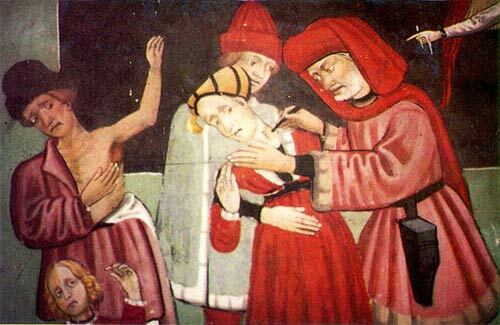 This illustration depicting a group of ill clergy, being instructed on what to do if they are incapacitated by a debilitating illness—in this instance, leprosy—is from Omne Bonum, a 14th-century encyclopedia (compiled by an Exchequer clerk, James le Palmer). The original is currently maintained at the British Library in London. Although this illumination is frequently associated with plague, it actually depicts leprosy. Only one bacterium is enough to fatally infect someone! The bacteria is found in rodents (the black rat during the great pestilence) and is transmitted from rats (and other rodents) to people by Xenopsylla cheopis (the oriental rat flea). If the host is infected, the flea is likely to get infected. When the host dies, the flea needs another source of food. That's when the trouble for people really begins (as shown in this image based on a 14th-century Flemish illustration). Bos, Carole "WHAT IS BUBONIC PLAGUE?" AwesomeStories.com. Jun 01, 2002. Apr 25, 2019.